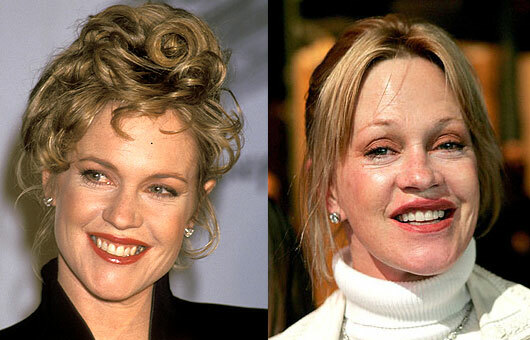 Melanie Griffith before and after plastic surgery. Once again we have the always evolving Hollywood starlet, Melanie Griffith, as we compare before and after photos to determine which plastic surgery procedures she has actually undergone. Last time we featured the actress, it was to showcase her exceedingly large lip injection/implants, however many other gossip sites believe Ms. Griffith has endured several other operations as well. Including an eye lift, brow lift, botox, cheek implants and perhaps even a mini face lift. And due to her frozen forehead, elevated eyebrows and stiff facial expressions, it would seem quite evident that she has in fact received an ample amount of botox injections, along with a brow lift and eyelid surgery (blepharoplasty). As for the other rumored procedures, cheek implants are a possibility, however it appears more likely she had some type of facial filler, which would explain the round plumpness to her face in the after photos. Believe it or not, some have speculated that shes also had some work done on her nose, but we'll save our assessment on that topic for a rainy day, meanwhile lets hear your own personal conclusions on her entire plastic surgery makeover. I always liked the way Melanie looked she looked better before surgery. 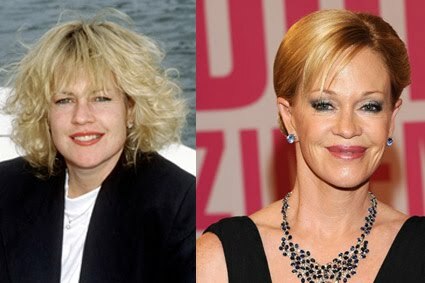 Just watched an episode of "Hot in Cleveland" with Melanie Griffith; she looks and sounds like she has had a stroke! I'm not sure who should be slapped harder...Melanie for messing up her face or the so called doctor. I saw her in Hot in Cleveland and UGH!! !She had natural beauty, she looked older than "Victoria"
she made mistakes but who hasn't? she has a loving husband and family and friends and that's what makes a person beautiful. I couldn't even recognize her on Hawaii five-o, it is sad. She used to be so cute, she should of just tried to age gracefully but now she looks plastic and her face is distorted and her nose what the heck happened there??? ?